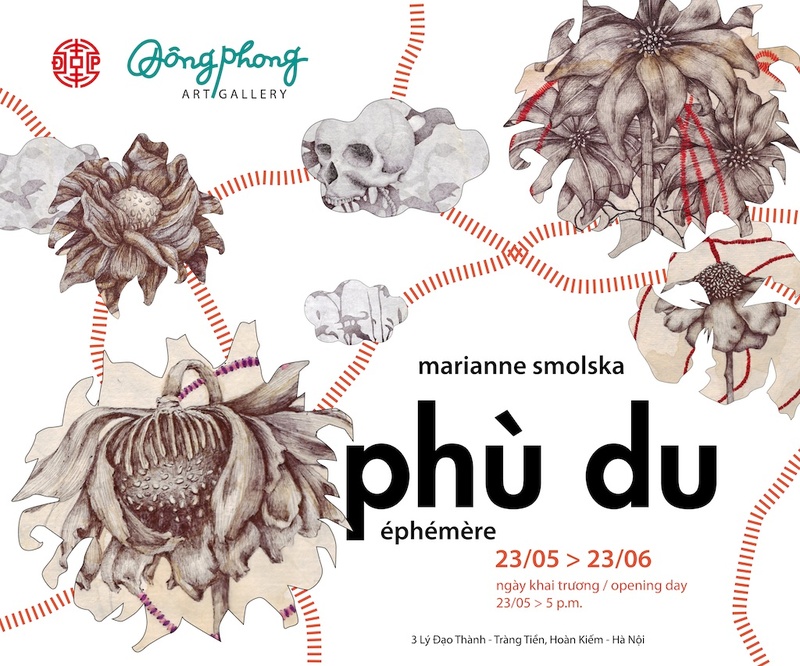 In Marianne Smolska’s new pictorial series entitled Phù Du, which means “ ephemeral ” in Vietnamese, delicate monochrome motifs (skulls, wilted flowers, brambles, roots and chrysalises) intertwine with embroideries on handmade Lao and Vietnamese paper. Started at David Bowie’s death, this ballpoint series is a reflection on the frailness of life, on the passing of time, on the inescapable aging of the body and on the wounds of bereavement that have to be tended, nursed and even stitched up. The bare threads, fragile lifelines, warps and wefts, webs or seams, sometimes caught in brambles, seem to seek to capture the pattern before it disappears. And when they are simply stretched or suspended, these strands seem to weave links between worlds; the world in which she lives, Vietnam, and the one where she comes from, France, but also between the word here below and the one beyond. The delicate illustrations embroidered by Marianne Smolska not only revive French and Dutch 17th century “ Vanitas ”, allegorical works of art in the form of still lifes about death and the futility of human passions, but also elements of Vietnamese culture: the use of organic paper, celestial In her raw, nearly flayed embroideries, Marianne Smolska does not seek to conceal the injury. She re-stitches it; she re-clothes the dead, decking them with back, blue and blood red flowers and embroideries and heals the wounds. At the heart of this hypersensitive work are sewing baskets, thread and needles. Her mother’s and her grandmother’s taken when her mother recently passed away. As though she didn’t want to lose the thread to keep the link that will forever prolong the never- ending ladies’ work of the long chain of women that preceded her and prevent the dead from fading into oblivion. Organic, frail, poetic, but also stormy, these embroideries on paper are seams, stitches and even erasures, she says; as though the artist wanted to retrieve from death that which it had taken from her and sublime grief. That which is certain is that through this work Marianne Smolska brings us to touch grace. A magnificent work to be discovered from May 23rd to June 23rd at the Dong Phong Gallery, 3 Ly Dao Thanh street in Hanoi.